Jeremy Frank: Networked Insights is a Madison, WI-based company specializing in customer intelligence in social media. Its goals are to raise the profile of the company and its technology, while also highlighting the growing strength of social media in the marketing arena. What made Forbes.com such a good hit for the company? How did you pitch reporter James Erik Abels? Frank: Forbes.com has a great reputation, as well as a horizontal reach across a number of industries. Networked Insights had produced a new report called “Measuring the Social,” which challenged traditional Nielsen ratings by tapping social media sites like Facebook and MySpace to measure engagement around TV shows. 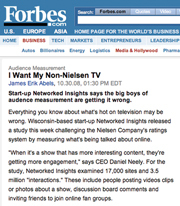 We used that as a hook to pitch [Abels], offering him a chance to speak with [Networked Insights] CEO Dan Neely and an ad executive who was working with [the company who] could attest to the success of this approach. Is social media still hot enough that any news will guarantee coverage? Frank: Social media is still very hot, but there's a lot of noise around it and Networked Insights is going directly up against an established company in Nielsen. So the report really gave us credibility to make the company's case. We also worked with [Neely] on delivering messages about the value proposition that this report provides marketers. Frank: The piece led to new business leads from several large media companies. It also generated plenty of good word of mouth about Networked Insights and its tools for measuring social media, so [Neely] was really pleased with our work.